What’s Love Got to Do With it (when it comes to Athlete-Starlet hookups)? MarkDashian is blowing up the internet rumor mill in the "sports offseason"
I’m confused, why is it that athletes and Hollywood starlets always end up pairing off together? I get that famous people want to be with other famous people, but what is it about the personality makeup of athletes and starlets that so frequently bring them together in relationships? If I have to start watching yet another sports team (beyond already the Nets, Dolphins, Lakers, and Mavericks) just so I can keep up with the latest happenings of my Kardashian girls, I’m gonna crack! First off, let’s just be grateful that Kourtney seems pretty locked in to her lukewarm relationship/baby making arrangement with Scott. So at least you do not have to get roped into tracking yet another sports team to keep up with the Kardashians’ significant others (beyond watching Scott’s occasional flirtations with the shuttlecock in badminton or squash matches with his fellow white collar, freeloading, vodka selling partners that E! sneaks into the show from time to time when they are short on content). You make some great observations and raise a wonderful question. Dating back to the Joltin’ Joe/Marilyn Monroe combo through the Andre Agassi/Brook Shields fling to Dennis Rodman/Carmen Electra’s bond and on to the more recent Kim Kardashian/Reggie Bush+Kris Humpries+Mark Sanchez triumvirate of relationships you aptly identified a real pattern in all of this historical pop culture data. We could even throw Tiger Woods into this category with his love(?) affair with Hollywood San Fernando Valley “starlet” Joslyn James (okay maybe we’ll just stick with the aforementioned examples and steer clear of Tiger’s tales of lust). We have found ourselves in sports’ longest offseason: past the Super Bowl, longing for Spring Training and March Madness, and settling for somewhat meaningless NBA regular season games (granted this sports doldrums period is only about 3-4 weeks, so no need to feel too bad for the sports addict closest to your heart). This time of year, US Weekly is the closest thing we get to a relevant Sports Illustrated. 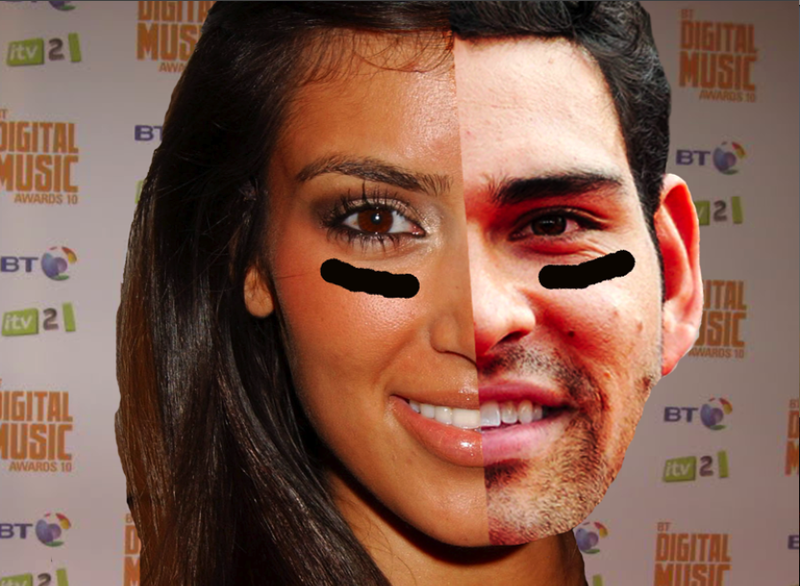 Nothing is hotter in the tabloids than the potential steamy Mark Sanchez and Kim Kardashian connection right on the heels of her Elizabeth Tayloresque 72-day long 2nd marriage. Whether the Markdashian relationship sprouts into a love affair (or simply fizzles as an unsubstantiated rumor), it serves as yet another example of the gravitational power of the athlete-starlet bond. While Mark Sanchez may not have the most polished ax-throwing skills, he does manage to toss the pigskin around well enough to occupy a starting NFL Quarterback gig. In acquiring this role, he is communicating to others within society that he is physically strong, healthy, and maybe even a little bit courageous too (unless you’ve seen Sanchez on this play!). These qualities are desirable to potential female suitors seeking out the strongest genetic material to pass on to their future offspring. Buss argues that the communication of these strengths/qualities is the most important driving factor in our selection of a partner and an underlying unconscious dynamic in all of our everyday interactions. Or more simply as comedian Adam Carolla says, life is more or less a series of events in “the sperm Olympics,”–who has the best sperm, who can acquire the best sperm, and who can pass on the highest quality genes to their kin. There are a number of metrics individuals use to decide who would make the best mate. Some of these measurements are visible, easy to observe with the naked eye (pun intended), while others are more subtle or require conversing with others to gauge their evolutionary strengths. For example, athletes overtly communicate to potential mates in society that they are strong, athletic, and they have a lot of money. Strength and athleticism are desirable gene characteristics, and money provides the ability for a family to maximize environmental variables in their child’s favor (i.e. private school, affluent peer group, safety from violence). However, one could argue that professionals, say scientists, offer just as much “evolutionary upside” to potential mates as athletes. Yet we are still waiting for the day that Paris Hilton goes trolling around the CalTech campus for mates in lieu of the more traditional L.A. night club scene. Scientists are smart, financially well off (to a certain degree), and offer some of the same environmental advantages provided by the overall cocoon of upper class life to their offspring as athletes do. I know what you’re saying, “yeah but Mark Sanchez is way more physically attractive than Dr. Scientist X, I don’t need your evolutionary psycho-babble to explain this happening!” But it’s not quite that simple. Attraction within relationships is an extremely complex phenomenon (if you don’t believe me explain Heidi Klum’s attraction to Seal in 1,000 words or less). One of the reasons athletes and starlets pair off together is because they mirror each other in terms of the skills they draw upon to make money (their bodies/looks). To become a successful athlete or starlet you need extremely rare, innate gifts that are born to you. For an athlete this might be a strong arm and great hand-eye coordination and for a Hollywood star this is likely some combination of God-given beauty, a nice smile, and a little bit of charisma. And you also need a bit of luck. These specific characteristics that both athletes and actresses draw upon in their successes are not terribly sophisticated in formation. You either have them or you don’t. Bombshell looks and/or the ability to run the 40 yard dash in 4.2 seconds does not require a great amount of internal struggle or personal cultivation in order to develop. These are awesome attributes to have and will take you far in life, but one does not necessarily have to work for them. Certainly, athletes practice all their lives at their sport, and starlets hone their craft through acting classes and such, but these require significantly less thoughtfulness and development than lives and careers that are defined by the use of one’s mind and emotions (and the arduous development time of each of these). Forefather of family therapy, Murray Bowen, described something similar to this attraction dynamic as “differentiation levels.” Differentiation in its most simple form is “emotional maturity.” Differentiation is one’s ability to manage both being an individual (separate from others), while also being close with others in relationships (it sounds pretty basic, but it’s remarkable how challenging this dialectical balance can be). Increasing one’s differentiation is believed to be a lifetime venture in which one grows in a capacity to better manage one’s own connections as well as independence from one’s family of origin and other close friendships. Bowen stated, “those with low differentiation depend on others’ approval and acceptance.” Athletes and starlets find themselves paired off together with such frequency because they usually are at such similarly low differentiation levels. Athletes and actresses are usually groomed for their future successes at young ages, placing them on very similar developmental tracks where the bulk of their personal development is built around developing one very specific skill (usually to the detriment of building a well-rounded range of psycho, social, and emotional skills). Similarly, their self worth is often so strongly guided by their successes and failures on the field or on screen as others judge them. And that PERPLEXED FROM PEORIA is your Valentine’s Day love story (or lack there of) of understanding the force that so commonly brings athletes and Hollywood starlets together.